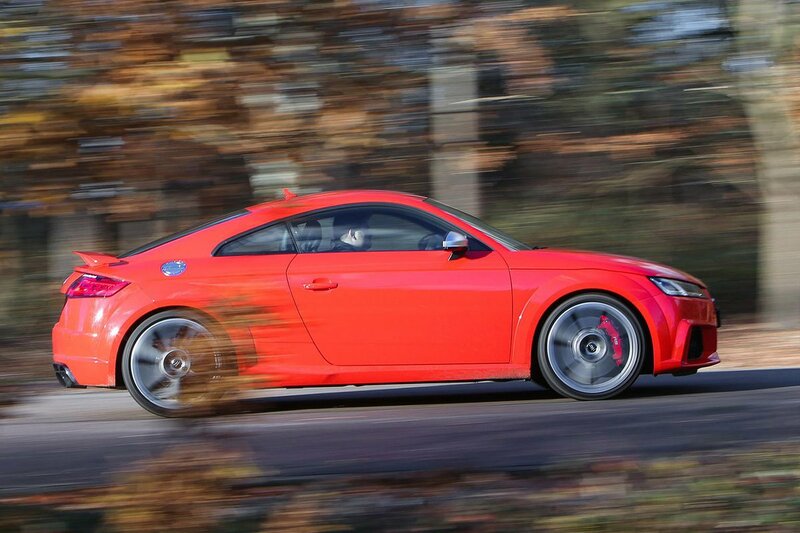 Audi TT RS Performance, Engine, Ride, Handling | What Car? The TT RS's quattro four-wheel drive system can shuffle up to 100% of the power to the front or rear wheels as required, helping transfer all of the car's power onto the road's surface with devastating effect – in both wet or dry conditions. The Coupé is faster than the Roadster, rushing from 0-62mph in a claimed 3.7sec, although the open-top is only just behind it. The former will then carry on to 155mph, unless you want it unleashed further by Audi for an extra cost, in which case the top speed increases to 174mph. The automatic gearbox is usefully responsive when you're driving hard, and the tactile paddle shifters are good to use. Ticking the sports exhaust option box is tempting, but Audi's five-cylinder engine sounds superb even through the standard tailpipe. 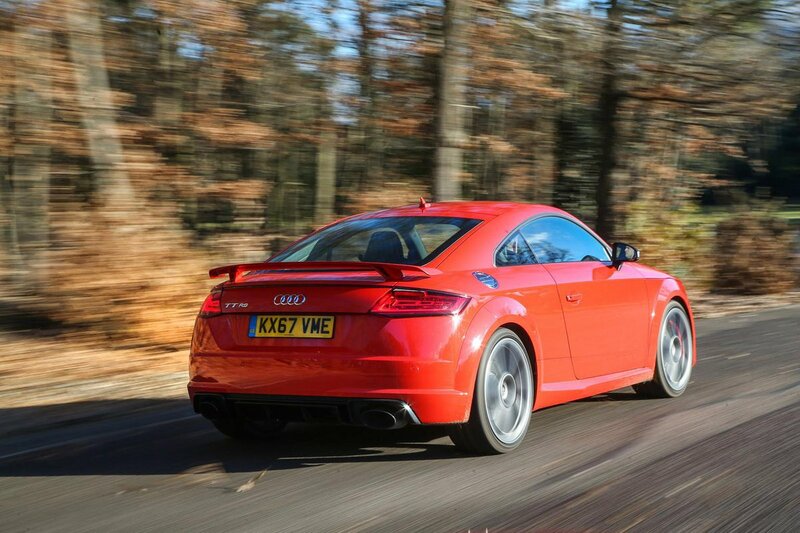 Although the TT RS might be quicker than a Cayman S or an M4, it won't impress keen drivers quite as much. 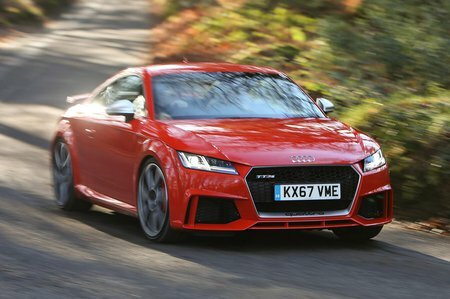 The Audi's steering isn't as communicative or precise as either rival, and while a massive amount of grip means the TT RS can cover ground at a staggering rate, it never feels as delicate or rewarding. The convertible TT RS Roadster is a bit heavier than the Coupé, and therefore marginally slower and less fuel efficient (it takes 0.2sec longer to get to 62mph from standing, and its claimed fuel economy is 0.4mpg worse). The straight line pace is still exhilarating, and the driving dynamics aren’t impaired despite the weight gain, plus the drop-top experience lets you hear its almighty engine note all the better. Every RS comes with a new part-Alcantara steering wheel, which is much like the one you'd find in Audi's flagship performance car, the R8. On this wheel, among other things, are two large round buttons – one to start the engine and another to flick between driving modes. The adaptive dampers (if fitted), steering, gearbox and throttle are all made more aggressive when switching to Dynamic mode, and it's here that the RS feels best when driven hard. The TT manages a convincing split personality, though. Fitted with standard 10mm-lower springs and 19in alloys the ride is firm but never uncomfortable, even with the optional 20in wheels. Adaptive dampers are available as an optional extra, and offer more flexibility with the ride depending on which drive mode you select. Aside from some road noise up at motorway speeds, the RS is quiet enough at the legal limit, too. There's very little wind noise, and switching to Comfort mode keeps exhaust boom to a minimum.